Judge Joseph Wapner, who helped pioneer the genre of court-based reality television, has died aged 97. He hosted a syndicated TV show, The People's Court, for more than a decade, gaining an audience of millions for his private arbitration of real life small claims cases. Before his television career, Judge Wapner spent 18 years on the bench of the Los Angeles Superior Court. His son, David Wapner, said his father had died in Los Angeles in his sleep. He had recently been hospitalised with breathing problems. To appear on The People's Court, over which Judge Wapner presided from 1981-1993, the plaintiff and defendant had to sign a binding arbitration agreement. "Everything on the show is real," Judge Wapner told the Associated Press in 1986. "There's no script, no rehearsal, no retakes. Everything from beginning to end is like a real courtroom, and I personally consider each case as a trial." 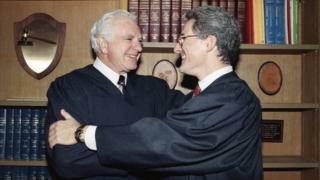 Judge Wapner became better known than the top judges on the US Supreme Court, many of whom were said to be fans of the show. He once settled a dispute between David Letterman and Johnny Carson on the latter's The Tonight Show. A truck owned by Mr Letterman had been towed away from a street in Malibu at Mr Carson's request, after he said it was an eyesore. The truck had damaged headlights when return to Mr Letterman, however, and Judge Wapner awarded him $24.95. The popularity of the TV court declined in the early 1990s, but flourished again from 1997 after the launch of Judge Judy, a show which Judge Wapner said he did not watch. Joseph Wapner received his law degree from the University of Southern California in 1948. He was awarded with the Bronze Star and the Purple Heart for his service during the Second World War.